Eike Batista was once the 7th richest man in the world. He had a net worth of USD$35 billion in 2012, having made his money from his publicly-listed mining, oil and gas companies in the decade-long commodities boom. By the end of that year, however, commodity prices had started to slide into a bear market; and by the end of 2014, Batista’s wealth had given way to over $1 billion in credit debt. Batista could possibly be the fastest wealth-destroyer in history. How does someone even make billions of dollars vanish overnight? Firstly, his wealth was fully concentrated in one single sector of the economy: commodities. It made him enormously rich. And then it made him broke. The way you became rich is not likely to be the way you can stay rich. Don’t borrow money to buy those eggs. A wealth consultancy group found that 70% of wealthy families lose their wealth by the second generation. 90% lose it completely by the third generation. Granted, much of this is the result of uncontrolled excessive spending and the younger generations not having a sense of the value of money, but many advisers who worked with those families revealed that another factor was that, very often, their wealth had been poorly invested in the first place. Imagine for a moment that you are Batista. You’ve made it big from your business. Your cognitive biases would very likely conclude that you had struck upon a profitable enterprise, and the best thing to do would be to pour more capital into it to expand the business further. 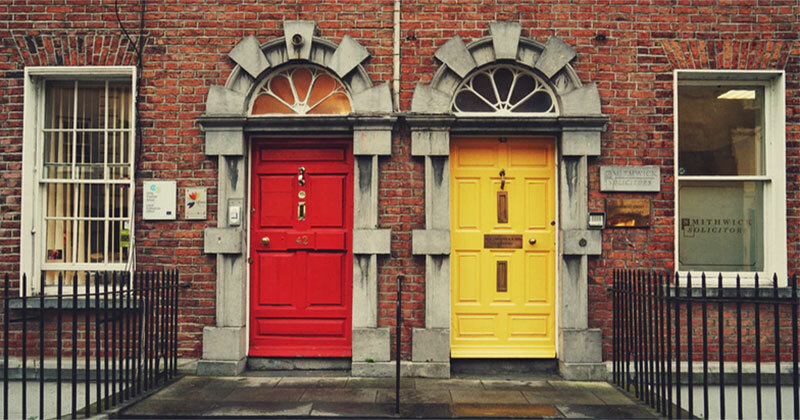 What reason would you have to instead sell your business, or even diversify? Yet the countless failures of successful businesses over the years is food for thought. Now, imagine that you are a smarter version of Batista. You want to preserve some of the wealth you’ve already created. Where should you stash that spare billion dollars? Most people would likely just put it into a deposit account at the bank, or into the safest bonds they can possibly buy. With so much money, you really don’t need to do anything to make it last for centuries, right? This is where people usually make the mistake of underestimating their future purchasing power. Let’s look at the various asset classes available to see which are able to maintain that purchasing power. Looking at Singapore government bond data from 2000 to the present day, we see that their nominal “risk-free rate” is 3.24%. That seems about right for an investment-grade sovereign bond. However, when you factor in inflation, that return rate halves to 1.63%! Such a low return would not leave you penniless if you had billions to begin with, but if you had to survive 30 years of retirement on a nest egg of $2 million – which is still out of reach for most people – you would find yourself drawing down on your savings quite fast. 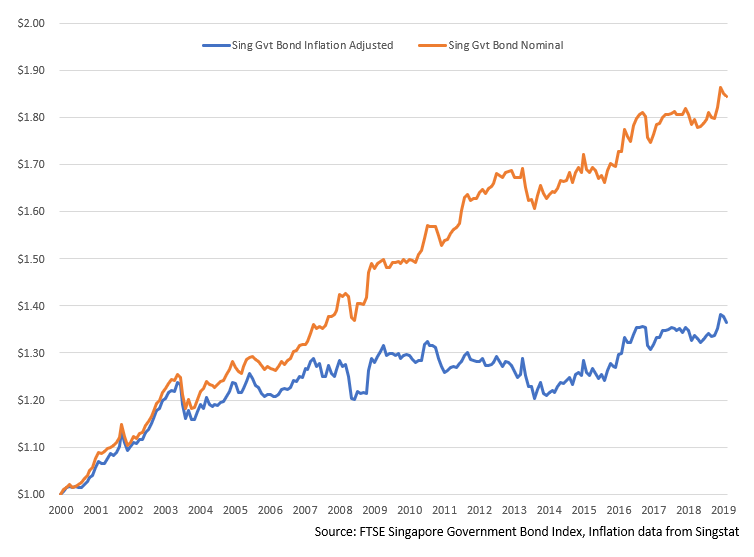 The chart below shows the significant difference between the nominal return and the real inflation-adjusted return of a Singapore government bond investment. Perhaps a more interesting chart is the one below, showing the drawdown on Singapore government bond investments over the years. Unknown to many investors, bonds – even the safest ones – do go through long periods of drawdowns. Investors who concentrate all their money in these safe assets and require a certain level of dividends may find themselves dipping into their capital to meet their needs, permanently injuring their portfolio as a result. That’s because bonds give back their par value, and don’t continuously increase in value the way that stocks or real assets do. Unlike bonds, Global stocks provide an inflation-adjusted return of 6.1%, more than enough to beat inflation and ensure that your money will grow over the long term. However, we also know all too well about how stocks are much more volatile and suffer from larger drawdowns than bonds. The following charts show the returns and drawdowns of global stocks (in SGD) over the years: they produce good long-term returns, but experience larger drawdowns than bonds. Some investors like commodities in their portfolios, believing that they provide a hedge against inflation. After all, there are only finite resources like oil and precious metals available for digging out of the ground. This means that their prices should theoretically go up as demand increases and supply remains the same. However, given Batista’s example above, you may realise that this isn’t necessarily the case – and the data backs it up. Since 1994, the commodities index has returned -0.4% to date after adjusting for inflation, and often suffers from severe and long-lasting drawdowns. If you really think about it, nothing is safe. Not bonds, not stocks, not gold. Not even property or land. Wanting the markets to provide you with high returns does not mean they will. Thinking that a particular currency is a good place to store value doesn’t mean that it will be. All this is simply because none of us can know what will happen in the future. No single asset class alone is able to safeguard purchasing power across multiple generations, just as no single biological trait can guarantee that an organism will pass on its genes. The world, investment environment and life are constantly changing. In order to keep up, we must be nimble enough to adapt. Many conservative investors keep their safe money in fixed deposits or savings accounts that earn safe government bond -like returns. But are those really the safest places for them? History and data would suggest otherwise. How then should you invest in order not to end up like another Eike Batista or one of the families that lose their wealth in a generation or two? Placing your funds into multiple asset classes reduces the probability that a blow-up in any one asset class will sink the entire portfolio. As such, the likely best bet is a diversified portfolio made up of different asset classes – bonds and cash for the safe assets, with equities and hard-assets as inflation hedges. This will not only keep you reasonably safe but also provide a sufficient long term return, regardless of how the market environment may evolve.